Finally, after 95 years, Ventura’s Grant Park has a hiking trail. Before construction of the path, Grant Park’s primary attraction was Serra Cross honoring Father Junipero Serra, the Franciscan monk who founded Ventura Mission and many more in California. First erected in 1782 as a navigation aid for travelers bound for Buenaventura by land and sea, the cross crowning the summit of the park has often been renovated and replaced. This park was badly burned in the Thomas Fire; check with park authorities for the latest access information. 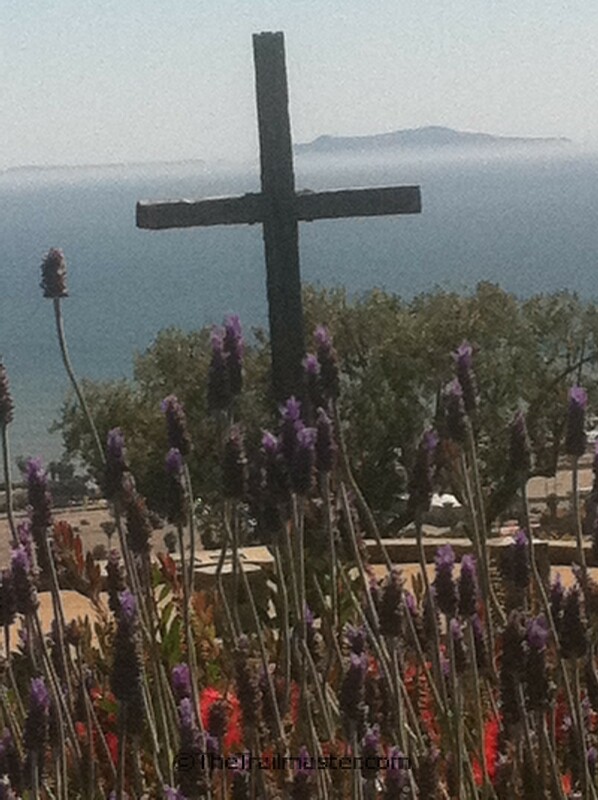 Serra Cross: spiritual uplift, romance and grand clear-day vistas. 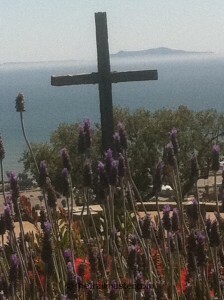 The view from the cross is commanding: the Ventura coastline, Anacapa and Santa Cruz islands and the wide blue Pacific. And romantic, too. Generations of Venturans have exchanged wedding vows at Serra Cross. 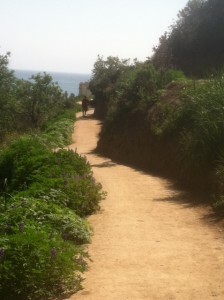 Construction and funding of the hiking trail was spearheaded by promoters of a plan to create a botanical garden with an emphasis on flora of the Ventura coast. Backers of Ventura Botanical Garden envision plantings in five areas representing the world’s Mediterranean climates: Chile, Australia, The Mediterranean, South Africa and, of course, Ventura. Beginning at Ventura’s century-old City Hall, the twisty trail ascends sage and cactus-dotted slopes. Venturans and visitors are oriented to the coast; the pathway may change that outlook and integrate the city’s hillside backdrop into public consciousness. Businessman Kenneth Grant planned to build an observatory on his hilltop property but gave up on that plan and in 1918 donated 107 acres to the city of Buenaventura. Some proud Venturans envision transforming Ventura via Grant Park in the same way San Francisco was transformed by Golden Gate Park. From Highway 101 northbound, exit on California Street. Stay in the center lane, make a right and drive 3 blocks north. Turn right on Poli Street, then make an immediate left into the parking lot behind City Hall. (From Highway 101 southbound, exit on Ventura Avenue. Turn right on Thompson Boule¬vard, make a left on California Street and drive 3 blocks north. Turn right on Poli Street, then left into the parking lot behind City Hall.) Locate the trailhead in the upper parking lot. Begin the gentle grade with numerous switchbacks ascending slopes cloaked with the coastal sage community. Get better and better views as you climb. Lupine and other wildflowers dot the slopes in spring. Get grand ocean vistas from a new trail that links Ventura City Hall with Grant Park and Serra Cross. Trail-builders unearthed cobblestones used a century ago to form terraces for agriculture. They were possibly built by Chinese immigrants, who were restricted at the time from owning more level and tillable parcels. About 200 feet of stone wall was incorporated into the trail design. The path ends at the park road. Go right 0.2 mile to a vista point. The 360-degree panorama includes mountains, metro Ventura, Ag-Land, Channel Islands and the wide blue Pacific. 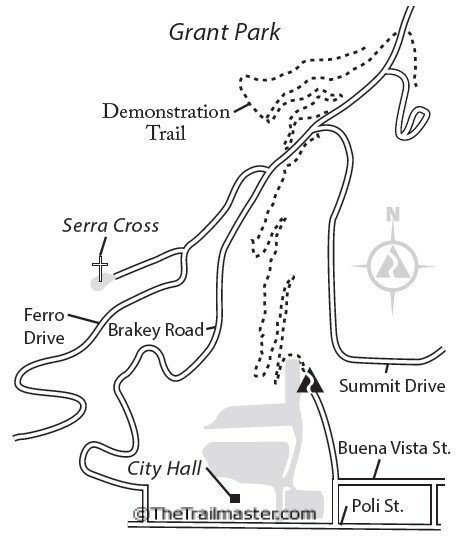 Turn left and walk 0.3 miles along the road to reach Serra Cross. 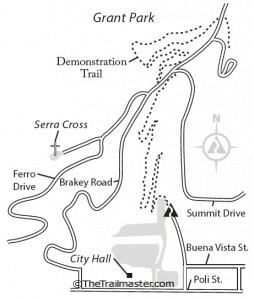 Reach Serra Cross by trail by improvising a route via pathways paralleling the road.